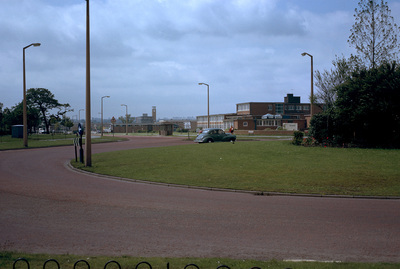 This photo of Newton Aycliffe takes place at a rotary near its Central Avenue, showcasing the way traffic intersects to reach the new towns' different residential and social spaces. This space connects to schools, churches, and retail as well. This indefinitely acts as the town centre. Bibliography: "The Newton Aycliffe Story." Great Aycliffe Town Council. 2016, www.great-aycliffe.gov.uk/info/about-aycliffe/the-newton-aycliffe-story/. Accessed 18 Apr. 2016. Obsorn, Frederic J. and Arnold Whittick. "New Towns: Their origins, Achievement and Progress." London: L. Hill, 1977, pp. 261-271. Smolski, Chester, "Newton Aycliffe: Rotary" (1980). Smolski Images. 1138.